It has been a season of celebration across the National Hockey League. The league has celebrated 100 years of existence with several Centennial Celebrations at various points of the 2016-17 season. Events like the NHL Centennial Classic, an outdoor game between the Detroit Red Wings and Toronto Maple Leafs, the unveiling of the top 100 NHL players of all time and other events have been sprinkled throughout the calendar in honor of the occasion. For the Los Angeles Kings, while the league has been celebrating 100 years of its history they have been celebrating their own. 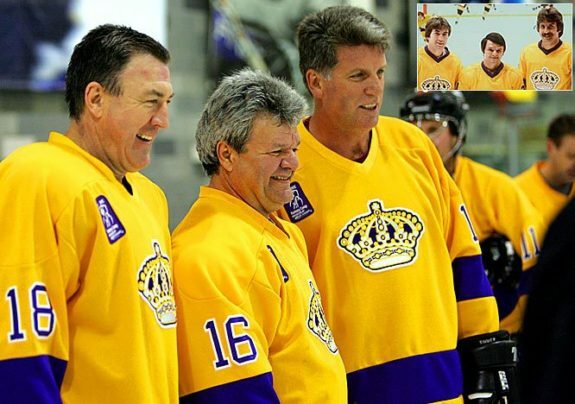 The Kings have been celebrating 50 years of hockey in Los Angeles. In honor of the anniversary, the team has unveiled a 50th Anniversary Monument featuring past and present players, a special 50th Anniversary jersey and logo has been used throughout the season, the team has hosted a Legends Night Series honoring the Kings of the past and the city welcomed the NHL’s best for the league’s All-Star weekend. Over the last 50 years, many greats have dawned the crown in Los Angeles. Kings of the past like Wayne Gretzky, Luc Robitaille, The Triple Crown Line with Marcel Dionne, Dave Taylor and Charlie Simmer all paved the way for players like Anze Kopitar, Drew Doughty and Jeff Carter today. But not all Los Angeles greats have been players looking to score goals. The Triple Crown Line of Taylor, Dionne and Simmer (Shelly Castellano/Icon SMI). There has been plenty of world-class talent in the crease for the Kings as well. As a matter of fact, over their 50-year history, there have been 68 different goalies between the pipes for the Kings. Some of those goalies stood in the Los Angeles crease for mere minutes and some racked up hundreds of wins for the organization. Which raises the question, who are the top three goalies to ever play for the Kings? We’ll take a walk down memory lane and try to answer just that. During his time with the Kings, Kelly Hrudey put together a 145-135-55 record with a 3.46 goals against average, a .896 save percentage and ten shutouts in 360 regular season games. Not the best numbers for a starting goalie but he was good enough to backstop the Wayne Gretzky-led Kings to the Stanley Cup Final in 1993, the franchise’s first trip to the final. Hrudey and the Kings ended up losing that series in five games to Patrick Roy and the Montreal Canadiens, but that series broke down a wall in Southern California hockey. At first glance, his numbers might not dazzle and amaze many, but the numbers don’t matter, Hrudey was an icon in Los Angeles. From the blue bandana under his helmet to the pump up video, “Hrudey’s On Duty” that would play throughout Southern California on game days and during the Kings’ run at the cup in 1993, Hrudey was a legend. If you skimmed over the music video above, go back. Go back and watch it now. You won’t regret it. See, how great was that. Okay back on track. The Forum, the black and silver and the “chevron logo” are all symbols of an era of Los Angeles hockey. Coupled with all of those iconic Kings images is Hrudey in net. Denis DeJordy, Dale Hoganson, Noel Price and Doug Robinson. Do those names ring a bell? Those were the four players that were sent to the Montreal Canadiens from the Kings when three-time Stanley Cup Champion Rogie Vachon asked to be traded. 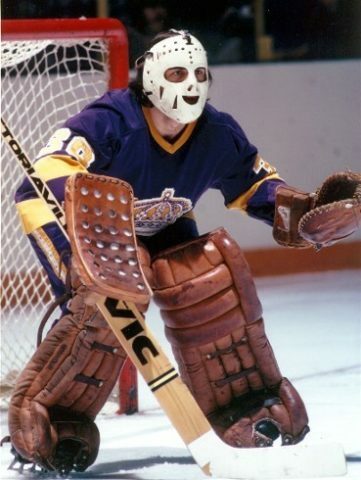 After watching Ken Dryden take over the number one spot and lead Montreal to a Stanley Cup championship in 1971, Vachon wanted out of Montreal and found his way to Los Angeles where he could continue his career as a starter. From 1971 to 1978 Vachon would anchor the Kings to 171 wins, put together 32 shutout victories and help the Kings to a 105-point 1974-75 season, which still stands as the highest point total in team history. At the conclusion of the 1974-75 season, Vachon was the runner-up for both the Vezina and Hart Trophy for the league’s best goalie and most valuable player. In 2016, Vachon was inducted into the Hockey Hall of Fame, something many thought should have happened years before that. With three Cups, a Vezina, a career record of 355-291-171, a goals against average of 2.99 and 52 shutouts in 795 games with Los Angeles, Montreal, Detroit and Boston it seems like most had a valid argument about Vachon’s being snubbed for so long. Although Vachon was a part of several teams over the course of his career he is remembered as a King. His number 30 was the first number retired in Los Angeles and he has held several executive positions within the organization — including as general manager from 1984-1992 and interim head coach on three different occasions. In many ways, the Kings wouldn’t be where they are without Vachon. Vachon set plenty of records during his time with the Kings, but records are meant to be broken and that brings up the number one goalie to ever protect the net in Los Angeles. This two-time Stanley Cup champion has rewritten the Kings’ record books, setting the pace with 252 wins, 476 games played, 42 shutouts and 11, 342 saves in just 476 games played. Among his career accomplishments, Quick has successfully anchored Los Angeles to two Stanley Cups, in 2012 and 2014, and was given the Conne Smythe Trophy as the most valuable player in 2012’s playoffs. Since he broke into the league during the 2008-09 season, Quick has made his share of incredible saves. But there was no save more miraculous than his scorpion-save on Winnipeg’s Dustin Byfuglien. But, for fans, the cherry on top of Quick’s ability to stop the puck is his, sometimes over the top, personality. The 31-year-old has never been one to shy away from altercations when in net. Whether it be waving over Eddie Lack after a post-whistle scrum, tossing Marcus Kruger’s stick or skating out to confront Corey Crawford during a commercial break, Quick has never shied away from the rough stuff. His smash-mouth style of play fits perfectly with the heavy style of play associated with his team and the fans that love it. Quick has been the full package for Los Angeles. The highlight-reel saves on his way up the franchise’s goalie rankings and the rough and tumble style of play that matches up so well with the Kings in front of him has pushed him into the record books and onto the list of the best the league has to offer.